With our first graduating class comes our first round of college admissions. At our State of the School address in February, we shared with participants some of the preliminary results of the tireless work of our BASIS Independent Silicon Valley Dean and College Counselor, Mr. Chris Wilcox, and our students as they worked together to fulfill college dreams. In their senior year, BASIS Independent Schools students take a daily College Counseling course and place a large focus of their time ensuring they have their best foot forward. We are pleased to share that all college admissions results are in: our very first graduating class has gained admission to some of the top universities in the nation! In a letter to the BASIS Independent Silicon Valley community on April 6, College Counselor Mr. Chris Wilcox shared, "What a wonderful inaugural year this has been on the college admissions front! Over spring break, our 14 seniors received news on the remainder of their college acceptances, and we now have a full list of colleges to report." He ends by sharing, "I am personally so proud of the accomplishments of each and every student. 100% of our students were admitted to a college, and all have multiple strong offers. Congrats seniors!" Our seniors did quite well with schools highlighted in US News & World Report. Over 70% of the graduating class had at least one offer of admission to a school ranked in the top 50 National Universities, and most of these students received offers to multiple schools in this list. Over 35% of the graduating class had at least one offer of admission to a school ranked in the top 25 National Universities. Our seniors did phenomenally well with the University of California school system. We had three students accepted to both Berkeley and UCLA. UC San Diego expressed the most love for BASIS Independent Silicon Valley students with an amazing 8 acceptances! Three seniors were offered admission to Ivy League schools this year – one to Yale University and two to Cornell University. 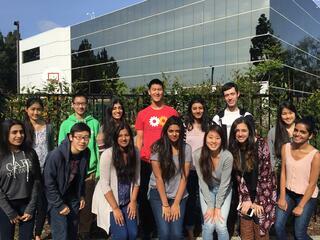 Congratulations to our students and to College Counselor Mr. Chris Wilcox for an outstanding first year of college acceptances at BASIS Independent Silicon Valley! As we grow from our two flagship campuses, BASIS Independent Silicon Valley and BASIS Independent Brooklyn, to planting our flag in some of the most exciting geographies in the country with BASIS Independent McLean, BASIS Independent Manhattan, and BASIS Independent Fremont, this incredible accomplishment is a sure sign of things to come for students at BASIS Independent Schools!